I don't claim to know much about architecture or design per se, but I like to think I have a good dose of taste as well as an affection for both. The pairing of architect sisters (Gisue and Mojgan Hariri who are Iranian-born and American-educated) in practice together since 1986, has produced some rather spectacular projects. "Their up-to-the-minute recasting of classical modernist principles has made them a source of continuing inspiration to design students and professionals alike," it says on the inside of the dustjacket. 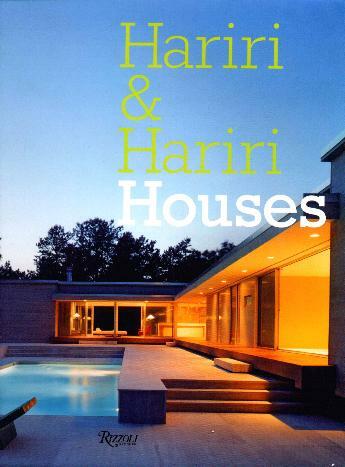 Gisue Hariri says in the preface, "Our goal has been to create structures that blur the distinction between inside and outside, open and closed, private and public, visible and invisible, expected and unexpected". The jewel in their crown is their house as part of the Houses at Sagaponack, Long Island, New York. I love the L-shape (my dream house will be L-shaped) and the big windows. However, it's pretty stark and devoid of character (for my taste) and perhaps too minimalist. I loved the Belmont house half-in and half-out of the hill, the library in the Fifth Avenue Penthouse, and the upper and lower level Soho Loft, but I need more frivolity in my home - not clutter - this is way beyond the opposite of clutter. I did like the layout of many of their designs but what I didn't find appealing were the "lines" in the transparent walls (reminiscent of Japanese screens) that was a feature in many of their houses, or the use of cables - more lines. Conclusion - Beautifully illustrated but unless you're drawn to this type of design, one may find it too stark. Wonderful however, for getting ideas for your home.